Back Row L-R: Coach John Hennemyre, Steve Christ, Dave Gray, Jim Troutwine, Frank Cheadle, Gary Riegle, Wayne Fisher, Jerry Garrison, Don Kochersperger, (Representing Scott Sutton) sons Justin and Adam Sutton and Athletic Director Jason Schondelmyer. Front Row L-R: Brenda Cheadle Eubanks, LeJean Etzler Riegle, Kent McGlinch and Bob Flatter. 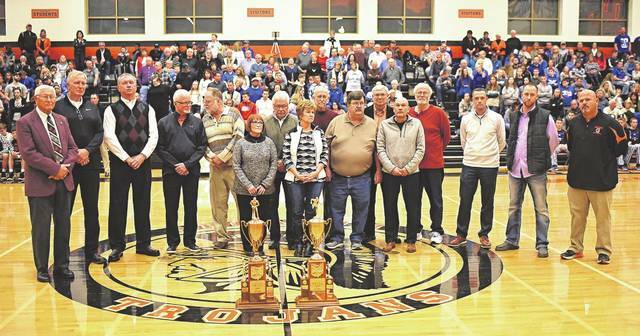 ARCANUM – The Arcanum-Butler Schools and Athletic Department recognized and celebrated the 50th anniversary of the 1969 State Basketball and Track & Field Championship Teams Friday night. The 1969 Boys Basketball Team was coached by Mr. Richard Graeff and Mr. John Hennemyre. They finished the season with an overall record of 27-2 and went on to win the State Championship. The Trojans defeated Versailles in districts then beat Granville and Lincoln Heights in the regionals. In the semifinal gave vs Portsmouth Clay the Trojans won 76-61. In that victory Dave Gray scored 45 points setting the state tournament record for scoring and field goals made in a state tournament game. The Trojans went on to beat Bridgeport in the finals 84-59, a game in which all 5 starters scored in double figures. The Trojans set records for the most points and field goals made in the combines 2 games. The members of the basketball team included; Frank Cheadle, Steve Christ, Wayne Fisher, Jerry Garrison, Dave Gray, Mike Gray, Chris Hanes, Kent McGlinch, Gary Riegle, Scott Sutton, Jim Troutwine, Jim Williams and Coaches Richard Graeff and John Hennemyre. Cheerleaders for the 1969 team included Brenda Bevin Eubank, Denis Condon Warrum, Bev Davidson Friedrick, LaJeanne Etzler Riegle and Jill Hundley Eisenburg. The 1969 Boys Track & Field Team also excelled and had a memorable year. Leading up to the State Championship, the Trojans were County League Champs, County Meet Champs and District Runners-up. The team accumulated 9 school records at the time, including 3 by Jim Troutwine and one each set by Steve Christ, Gary Riegle, Chris Hanes, Allen Wentworth, Dan Riegle and Dave Gray. Members who participated at state included Pete Wentworth, Dan Riegle, Chris Hanes, Gary Riegle, Jim Troutwine and Steve Christ. The State Champion Mile Relay Team of Dan Riegle, Chris Hanes, Gary Riegle and Jim Troutwine set the state record in the mile relay. Additionally, Jim Troutwine was the individual High Jump Champion. Members of the Track Team included Bill Bennett, Rude Besecker, Steve Christ, Sonny Clapp, Phil Cox, Wayne Fisher, Nathan Garber, Dave Gray, Chris Hanes, Don Kochersperger, Nick Lockman, Lee Martin, Kent McGlinch, Dan Riegle, Gary Riegle, Jim Troutwine, Pete Wentworth, John Whiting, Jim Williams, Rob Wogomen and Lannie Wright.